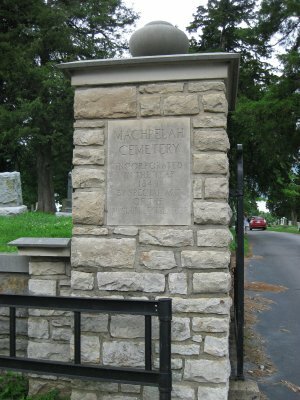 Directions: Machpelah Cemetery [ Waypoint = N39 10.748 W93 52.356 ] is located just south of Poplar Street on 20th Street in Lexington, Missouri 64067. From Visitor Center - Turn left out of the Visitor Center parking lot onto Delaware and head back to 13th Street. Turn right (south) onto 13th Street. After about 1.2 miles, turn left onto 20th Street. After about 0.4 miles, the entrance to Machpelah Cemetery will be on your left (west). From I-70: Take exit 49 onto Hwy. 13 north (towards Higginsville). It is about 17.5 miles to 20th Street in Lexington. Turn right (north) onto 20th Street. After about 0.4 miles, the entrance to Machpelah Cemetery will be on your left (west). Description: Here at Machpelah Cemetery were a couple of hours of skirmishing between the Missouri State Guard, commanded by Major General Sterling Price, and the Union Defenders, commanded by Colonel James A. Mulligan. Mulligan had sent a force out to delay Price's advance so as to gain more time to fortify his entrenchments at the Masonic College. After "chastising" Lane near Dry Wood Creek, Price continued his march north. Hearing that Union troops were headed for Warrensburg, Missouri to appropriate the bank's funds and arrest secessionists, Price decided to order a forced march to prevent this. When he reached Warrensburg, he encountered Union Colonel Everett Peabody's 13th Missouri Volunteer Infantry, but the Federals withdrew before there was an engagement. After the forced march, Price's infantry was exhausted and had been without food for more than 24 hours. The Missouri State Guard spent the night at Warrensburg. On the morning of September 12th, Price decided to press ahead to Lexington with his cavalry. He would let his infantry rest and catch up later. On September 12, 1861, Major General Sterling Price reached the southern outskirts of Lexington, Missouri at the head of his cavalry detachment. His troops were exhausted, so Price spent the night there. The next morning (September 13th), Price headed into Lexington with his cavalry and infantry and met Union Colonel Mulligan's pickets. Not wanting a full engagement until his infantry and artillery came up from Warrensburg, Price withdrew to the west and approached from the Independence - Lexington Road. 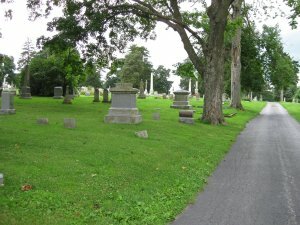 According to Union Colonel Mulligan's version of events, there was sharp skirmishing in the Lexington Cemetery (actually called the Machpelah Cemetery located north of the intersection of 20th Street and Highway 13 in Lexington, Missouri 64067). The Federals withdrew back into their entrenchments. "On the 12th [of September] Price reached Lexington, moving from the Warrensburg road through the lane in front of General Shields' house, to the old Independence road at Edenview church. Near this place a small party of cavalry were encountered by our advance guard and driven to town. A regiment of infantry posted near the cemetery gave our advance guard a warm reception, and stood their ground until Price sent forward a force of infantry and Bledsoe's battery. The Federals were forced to return to the works around the college. Bledsoe's battery was posted on the ground where Wentworth Military Academy now stands, and fired several rounds into the works." "At noon of the 11th we commenced throwing up entrenchments. We had selected college hill, an eminence overlooking Lexington and the broad Missouri. All day long the men worked untiringly with the shovel. That evening, but six or eight hours after we had commenced throwing up earth-works, our pickets were driven in and intimation given that the enemy were upon us. Col. Peabody was ordered out to meet them, two six pounders were planted in a position to command a covered bridge by which the enemy were obliged to enter the town, and so we were prepared. That night the enemy, seeing our preparations, remained on the other side of the bridge, but it was a night of fearful anxiety. None knew at what moment the enemy would be upon our devoted little band, and the hours passed in silence and anxious waiting Thus we waited until morning vigilantly and without sleep, when some one rushed in saying: "Colonel, the enemy are pushing across the bridge in overwhelming force." With a glass we could see them as they came. Gen. Price upon his horse, riding up and down through his lines, urging his men on. Two companies of the Missouri Thirteenth were ordered out, and with Co. K of the Irish brigade quickly checked the enemy, drove them back, burned the bridge, and gallantly ended their day's work before breakfast. The enemy made a detour, and approached the town once more by the Independence road. Six companies of the Missouri regiment were ordered out to meet them in the Lexington cemetery, just outside the town, and the fight raged furiously over the dead. We succeeded in keeping the enemy in check, and in the meantime the work with the shovel went bravely on, the diggers sometimes pausing in their work to cast anxious looks toward the graveyard where their comrades were engaged in the deadly strife, and yet the shovel was swiftly plied." Now the Federals were back inside of their entrenchments, on which they had been working since noon on September 11th. Colonel Mulligan brought his officers together for a council of war. The consensus of his officers were to evacuate the garrison. But Mulligan had made his decision. He was under orders to hold at all costs, and besides, reinforcements were on the way. It was only a matter of holding on until those reinforcements arrived. Their entrenchments were strong. "Finding, after sunset, that our ammunition, the most of which had been left behind on the march from Springfield, was nearly exhausted, and that my men, thousands of whom had not eaten a particle in thirty-six hours, required rest and food, I withdrew to the fair ground and encamped there."